Increasing productivity, efficiency and staff engagement to drive business gains is the goal of most growth oriented organisations, but most don’t seem to be able to adopt a system that can help them achieve this. The Toyota Production System (TPS), the main source for Lean programmes, is the universally applicable and accepted system that has proven the test of time in improving business productivity. The roots of TPS were formed with the establishment of the Toyota Motor Company by Kiichiro Toyoda in 1937 and the Honsha Plant being built in 1938. Toyota achieved production of 100,000 vehicles by 1947. In 1959, production started in Brazil, and 1962 saw the production of the millionth vehicle. Kiichiro developed new processes for internal production and procurement that were “just-in-time” to avoid waste. With a new factory layout, a process flow was implemented that resulted in an improved flow of operations and a tremendous growth rate for the company. 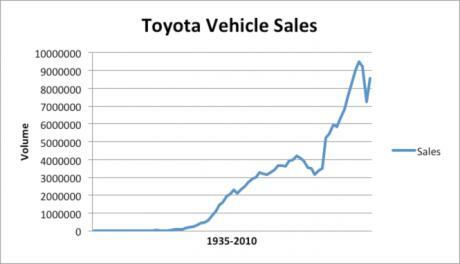 The chart below shows sales of Toyota vehicles from 1935 to 2010. This success comes from focusing on customer value in terms of quality and cost. Although TPS originated in Japan and comes from an automotive business, it’s not country specific and its principles can be applied to any company’s processes. New Zealand has the challenge of being located far away from its customer base, and as a result it can be argued that going ‘Lean’ is of greater importance for us to remain competitive in today’s global market place. Using TPS, when Lean programmes are implemented correctly companies can expect to see improvements in quality and delivery whilst reducing costs. They can also expect to see greater employee engagement and empowerment. Kiwi companies benefitting from the Toyota Production System include Proform Plastics, Compac Sorting Equipment, Pacific Aerospace, Stainless Design and NuFarm. Alf McLaughlin, General Manager, Pacific Aerospace is immensely satisfied with the productivity outcomes for his company as a result of using this programme. “I think our results have been excellent in terms of morale, staff buy- in, and change of culture. [Lean Group] knows the right process – the 5S process has been critical for staff, particularly the guys on the shop floor, to understand productivity improvement,” Alf says.